Let's just be honest. Classroom management is hard. It's one of these intangible things where there isn't just an easy fix. 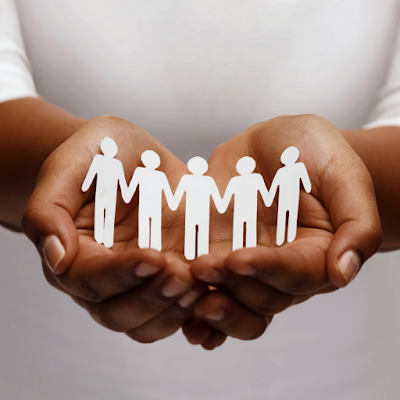 However, there are effective strategies that can help. It takes time to find tricks that work for you, your school, and your students because every situation is different. I get it because I've been there. When I started teaching high school 12 years ago, I was just 22 years old, only a couple years older than many of my students. I was utterly unprepared and a classroom management nightmare. Thankfully, since then, I've taught in a variety of environments that have helped me improve my ability to manage my students. I've taught in 6 different middle and high schools for grades 6-12 in 4 different public districts in 2 different states. I've been in schools that were rural and mostly Caucasian, another that was urban and at least 50 percent African American, and I now teach in a suburban school in a university city that is so diverse I couldn't really begin to give you the racial breakdowns. As you can see, I've experienced a wide variety of different student body makeups and teaching environments ranging from easy-as-pie to extremely challenging. Somehow, through my experiences and trial by fire through the years, I went from being fairly inept at classroom management to have it become one of my biggest strengths. Today, I'm excited to share some strategies that have made a world of difference in my ability not just to manage my classes, but to work in an environment where my students can learn and I teach. Maybe I should start off by saying that it's part of my personality to be extremely forthright and honest, so it shouldn't come as a surprise that, in my opinion, setting clear expectations is the most important thing that teachers can do to set the stage for what the year will look like. You can do this any way you want. You can come up with the expectations yourself or you can let your students help you come up with what the class norms will be. Call me mean, but I come up with them on my own. It took me a while to be able to outline exactly what things mattered, but now my students are very clear about what I'm looking for. I try to spin my expectations positively by detailing what I do want to see as opposed to what I don't, but my students know what is appropriate in my class and what is not. Some still choose to ignore my expectations and do what they want, but I'll get to what I do about that soon. Once I've defined my expectations, I make sure the kids know them. A lot. I teach my expectations and informally assess my students' understanding of those expectations repeatedly, but I try to make it at least feel novel and as interesting as humanly possible as I review them. Last year, I used Piktochart to create a syllabus that laid out my expectations in a graphically clear way, which seemed to work really well for the kids. The next day, I used a Prezi to go over all of my expectations, especially the more specific details, with students, followed by some situational role-plays. I broke students into pairs and had them demonstrate what it looks like and sounds like for students to start class. Finally, I have students do an exit slip called an "Expectations Challenge" where I give students a handout with different situations and they have to write what the appropriate expectations would be. For example, "You've missed the last few days of class. What should you do? Where will you find your makeup work? When is it due?" It may sound like overkill, but I'm fine with that. My students need to know what I expect, and I need to know that they understand fully. Plus, I always spice it up with my witty banter and dazzling personality, so that obviously helps. I have a couple different graphic posters on my wall that reiterate my expectations, so I reference them often. Both of them are based on the CHAMPS classroom management system, which I LOVE because it helps teachers "develop an instructional structure in which students are responsible, motivated, and highly engaged in the specific task at hand." 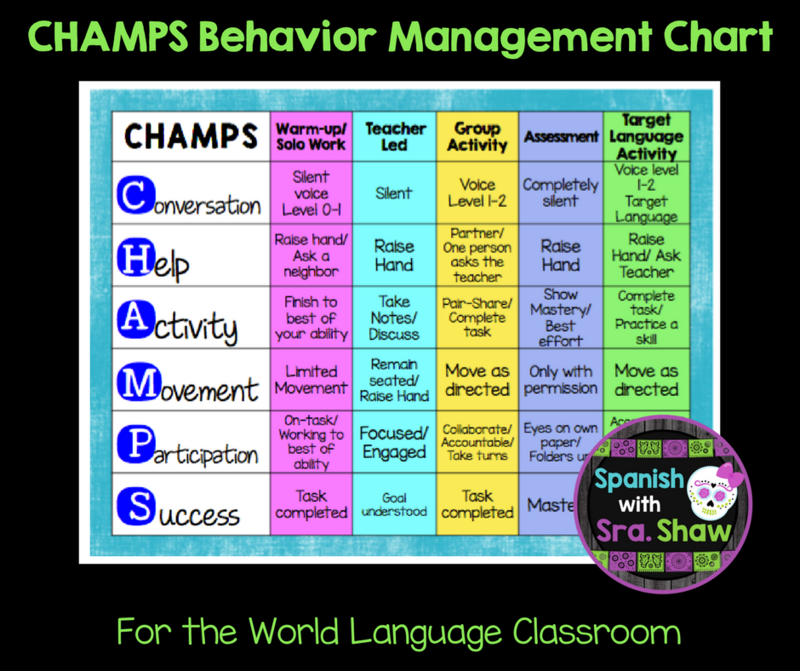 CHAMPS seriously changed the way I teach and improved my classroom management because it forced me to think out my expectations for my classroom and for different instructional activities. I think they are cute and most importantly, effective, at helping remind my students what I want them to do. I keep the chart below prominently displayed in my classroom and teach my students the behavioral expectations for different types of activities early on in the school year, before many lessons until they get the system, and the as needed throughout the rest of the year. This poster and the CHAMPS model changed my teaching more than any other single method and I cannot recommend it enough. I encourage you to read my recent blog post fort the 5 reasons why the CHAMPS method will improve your classroom management. Trust me, it really does work. Everyone has their favorite method or book about classroom management, behavior management, discipline strategieis, student engagement, or whatever the popular tagline is this year. I personally have trouble reading Harry Wong's ever-popular undergrad favorite The First Days of School without wincing, but he certainly does have some very worthwhile and effective ideas. As you know, my personal favorite is CHAMPs or its secondary version, Disclipline in the Secondary Classroom. Other popular methods are Teach Like a Champion and Teach Like a Pirate. Even though I've been teaching for years, reading and reviewing classroom management techniques is essential to refine my practice, remind myself of habits I need steer away from, or things I should try. I know this one is a little cliché, but seriously, we all know students perform best for teachers they have a relationship with. I'm very firm (some students would say strict), but I make it a priority to get to know my students so I understand what makes them tick and to help me connect with them. Meet them at the door as often as your busy schedule allows, go to their events, find out who their friends are, ask what they did over the weekend, eat lunch with them in the cafeteria, whatever it takes. 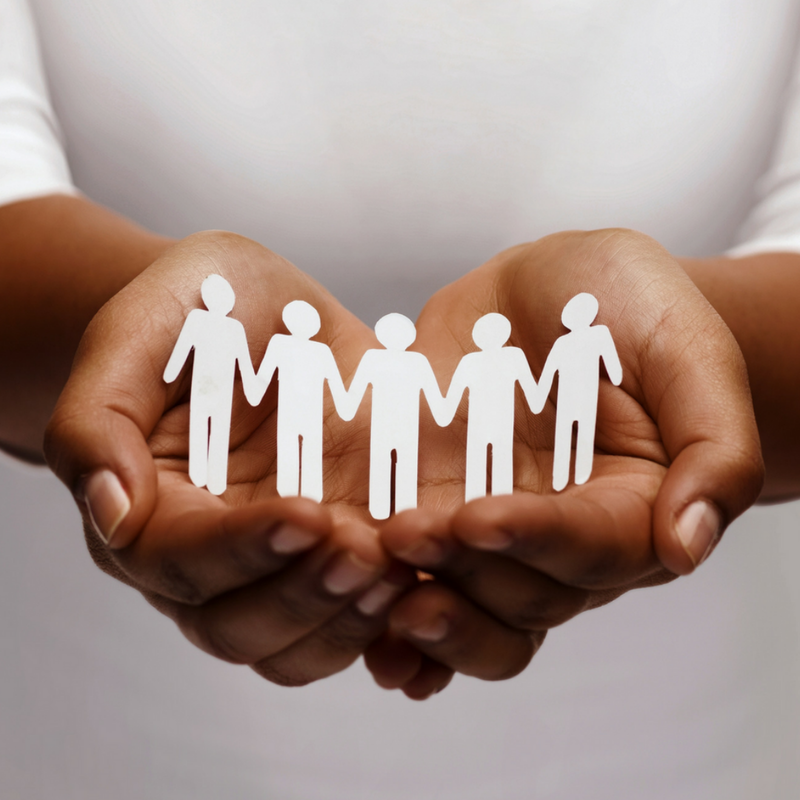 We all have our strategies for building relationships with students and it matters immensely. To be completely honest, building relationships is probably the area I struggle most with or the thing I'm most concerned about. Last year, I used several of the suggestions in Catharyn's (AKA Sol Azucar) post about how to create good vibes in the the Spanish classroom and I was really pleased with how much better I felt I knew my students and how much they knew one another. There's seriously so many good ideas here! Check it out! In my first teaching position, I taught my students in 20 hour blocks, 5 days a week, with 3 preps. I was essentially set up for failure because there was no way I was experienced enough to keep my students engaged and occupied for that much class time. 12 years later, I still see the value of keeping them busy (ahem, engaged). I start each class with different kinds of warm-ups that I expect my students to start BEFORE the bell and I teach until the bell or do some sort of exit slip. I don't know about you, but I find that I get students of extremely varying abilities and thus, I get some kids who finish things very early. I have a list of activities that fast-finishers are expected to do while their peers are still working. A couple of my favorite fast-finisher tasks are DuoLingo, logic puzzles, and LyricsTraining.com. Find a couple that work for your classroom and go from there, but there's nothing better than never having kids say, "Sr./Sra./Srta. _____, I'm done!" If you train them and go over what to do when they're done before letting them start an activity, you won't have to repeat yourself 1000000 times. I'll admit it. I'm a control freak and I've come to be ok with that label. I also always start every first day of school with a seating chart and kids stay in a seating chart FOREVER. For the first time ever, last year I trusted one group of my 8th grade students so much that I let them select their own seats, but I waited until early May to let it happen. I applaud those of you who are more laid back and your kids succeed in whatever seats they've chosen, but it's just not for me. Plus, I teach middle school; it's a different world. When I have student teachers/teaching interns, one of the first things I have them do after they've observed for a few weeks is create a seating chart for a couple of classes and then I sit down with them and we go over it together. We talk about the importance of placing students where they are going to succeed and pairing students appropriately. What to do about seating charts on the first day of school when you don't know the kids? One of my favorite mottos is "Randomness is the spice of life." My school's gradebook software has a seating chart feature that lets me create a classroom layout and then I can select for it to randomly place students in a seat. Another alternative is to use a random grouping strategy like Martina Bex's adorable (and free) character seating cards. Although I've never tried personally tried Jessica's (AKA Miss Señorita) idea to let kids choose their own seats on the first day of class as she describes in this post, it's genius. What a tricky lady. Definitely check it out. How many times have you found yourself trying to get your students' attention by repeatedly saying, "Silencio. Escuchan," only to have them completely ignore you? I did this more times during my early care than I care to admit and the result was completely ineffective if not undermining. When I implemented the CHAMPS method, our trainer recommended teaching callbacks and I thought to myself, "Oh heck no. I am not an elementary teacher." Seriously, call-backs make me cringe especially when a trainer uses them in PD like all of us are first-graders. Unfortunately, and I hate to admit this, call-backs work. If you can find ones that you and your students like and that you can use without completely embarrassing yourself, they're extremely effective. For example, when I say, "Hola, hola" my students must respond "Coca-cola." The key is that they have to stop speaking to one another to repsond with the "Cola-cola." Here's an amazing list of ideas for attention grabbers and call-backs from Spanish Playground that you really should check out. I'm sure some of you are thinking, "Who is she kidding? A call home doesn't work for all kids!" You're absolutely right and I am the first to admit that the 9 suggestions above will not work for all schools, students, and classrooms. At my school, historically, we've had very little administrative support, so I pretty much handle all classroom management on my own without the ability to write disciplinary referrals or send students to the principal's office. When I inevitably find kids who could give a **** less about my beautiful expectation presentations or a call home, I've got to get creative. If that means creepily showing up at their class right before lunch and bringing them to my classroom, so be it. If that means I keep them after school to help clean my room and get to know them better, ok. If that means I contact little Johnny's basketball coach and explain my behavior concerns and then the kid runs their tail off in practice that day, awesome. Whatever works, within reason, of course. 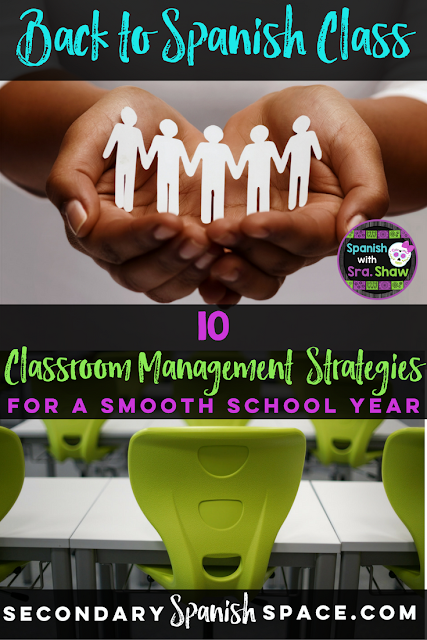 I hope today you found a few classroom management strategies that you can use to have a smoother, saner year. Remember, it's a process that we are constantly working on improving and there will be "those days" where things went less than perfectly. Stick with it, try something new, you've got this! Remember, it's so much easier to do be in this amazing profession when your teaching environment is relaxed and effective. You can teach that amazing lesson you so carefully planned so much better when your kids are engaged, respetful, and know what you expect. Have a great school year! Hi Jen! 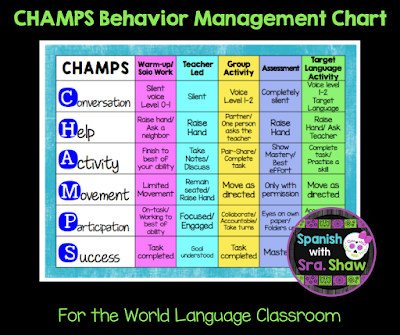 How can I find or buy that same champs behavior management chart? Thank you!